Ubud, Bali. 8 October 2018 - On August 5, a powerful 7.0-magnitude earthquake struck the island of Lombok, leaving a death toll of 560 and more than 1,400 injured. Nearly 400,000 residents were displaced from their homes as tremors ranging from 5.0-6.9 magnitude continued for weeks. Thousands of buildings in the area were damaged, halting daily and productive activities in the area. Thanks to the overwhelming support of hundreds of crowdfunding donors, Kopernik was able to quickly raise the funds needed to respond to the urgent needs of affected families. 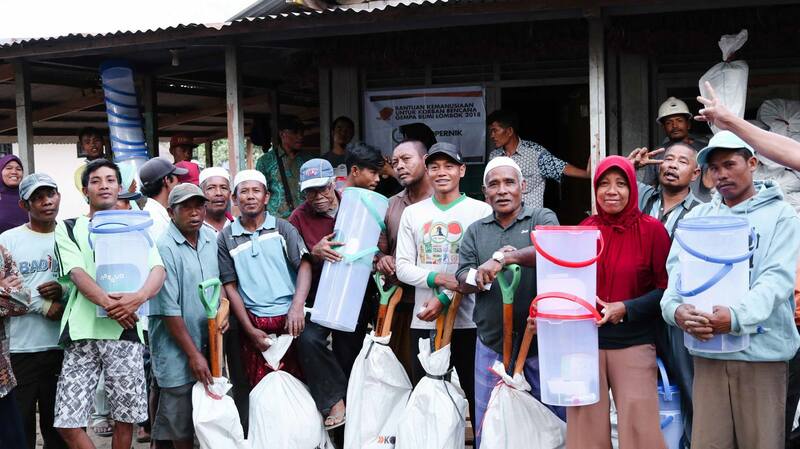 Within days following the major quake, Kopernik emergency response team traveled to Lombok to make the first delivery of shelter kits comprising of tarps, mats, blankets, sarongs, saws, crowbars, shovels, hammers, gloves, sledgehammers, and hoes. To remain alert of the evolving situation and ensure that the support reaches those who need it most, Kopernik has now set up a base camp for emergency response in Mataram, Lombok. The team has since been focusing the efforts on one village in North Lombok, Salut village, as well as one in East Lombok, Sembalun Bumbung. It is only thanks to the support of donors like you that Kopernik has been able to respond swiftly to the urgent needs on the ground. We would like to express our deepest gratitude for the tremendous support shown from near and far, including from community groups such as Suzy Hutomo and her Singaporean friends, The Body Shop Indonesia, Bali International Women’s Association, J2 Japan & J2 Indonesia, students from Sekolahalam Minangkabau, the Sunrise School Bali, Bandung Independent School, Surabaya International School and the Green School. We also received great support from musicians and artists such as Adib Hidayat and Jerinx from Superman is Dead who raised funds through Kita Bisa, as well as businesses such as the UBUD RAW Chocolate Factory, Ubud Yoga Centre, Sisi Bags, Grand Luley Manado, Bridges Restaurant and Zen Bali. We also thank Hard Rock Cafe Bali for their generous donation and PundiX who promoted our crowdfunding efforts through their channels. A distribution of shelter kits and water filters for families in Sembalun Bumbung village, East Lombok affected by the recent earthquakes. Kopernik’s ability to support the urgent needs of communities affected by the earthquake in Lombok have been made possible thanks to the partnerships established with a number of businesses and organizations. With support from the London-based beverage company Diageo, Kopernik is distributing 1,000 water filters that will provide families living in temporary shelters as well as public facilities such as schools and village offices with access to affordable safe drinking water. In partnership with the French Embassy in Indonesia, we are delivering 1,000 shelter kits and 500 reconstruction kits and are building 50 latrines. Kopernik is also working with PT Selamat Sempurna to establish an additional of 14 latrines for public facilities such as schools and health centers, in Salut village, North Lombok and Sembalun Bumbung village, East Lombok. 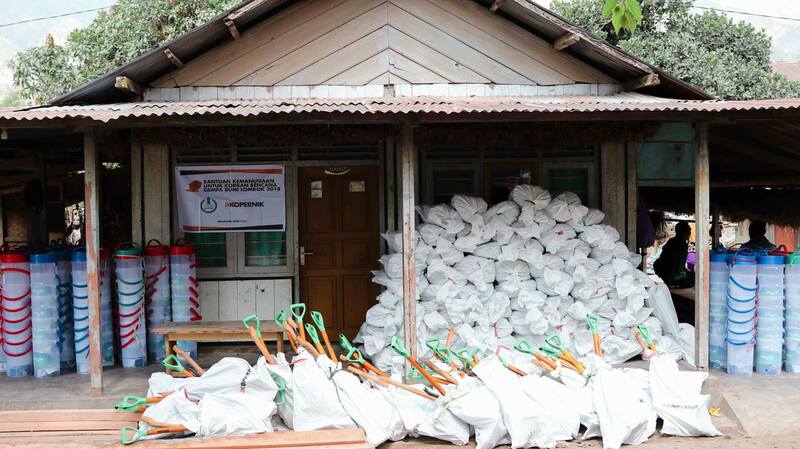 Together with Yayasan Rumah Energi Indonesia, with funds from Care International Indonesia, Kopernik is delivering 1,000 hygiene kits focusing on women, girls, and children under five years old. To support families with renewable lighting, Kopernik is partnering with Signify Foundation to deliver 800 units of solar lights. The collective spirit shown by communities and organizations in the time of emergency has been invaluable to Kopernik’s work to support evacuees who are currently still living in temporary homes. It would have been impossible for the organization to achieve its impact without the support of both crowdfunding and corporate donors. For that, Kopernik would like to say a big thank you to all supporters of the Lombok Emergency Response. Kopernik remains alert and committed to providing needed support as the government works towards rebuilding and rehabilitating damaged areas in Lombok.